The suspension on my Wing was getting pretty bad. So I decided to replace the springs with Progressive Suspension springs. I purchased a 2 inch floor flange from Home Depot. About $13. I also purchased some threaded rod. About $4. 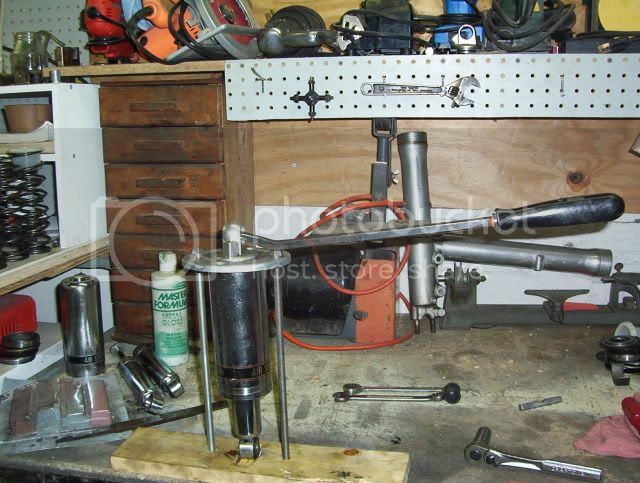 Along with a few hardened nuts and some steel stock I had laying around I built a tool to compress the shocks. 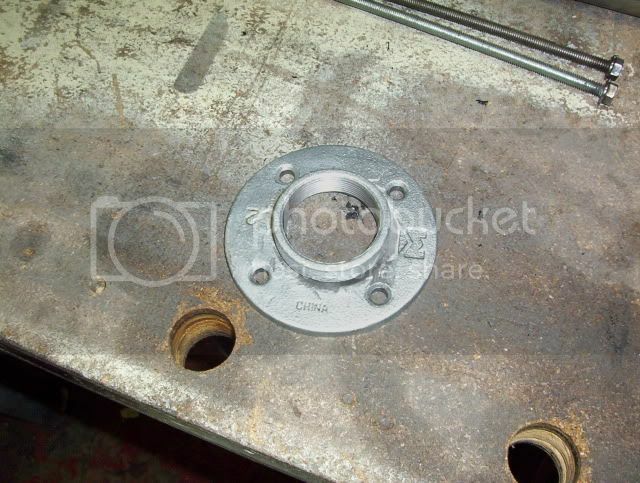 The 2 inch floor flange has a tapered opening to the threaded barrel. With the barrel cut off the flange "donut" is a perfect fit for the top of the shock, and the tapered opening is great for kelping to keep the shock in position. 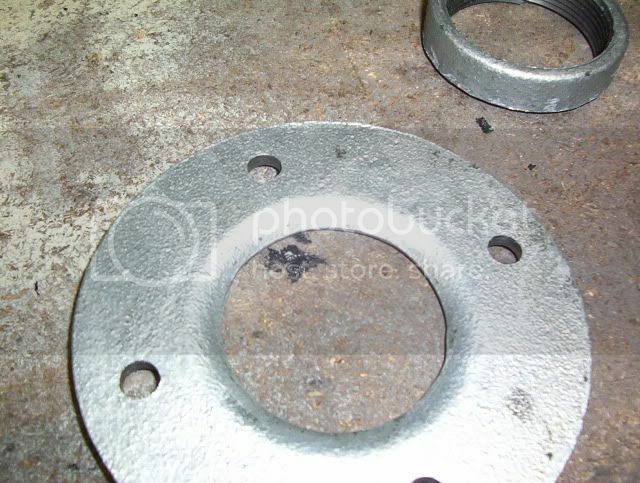 Here is a shot of the floor flange. 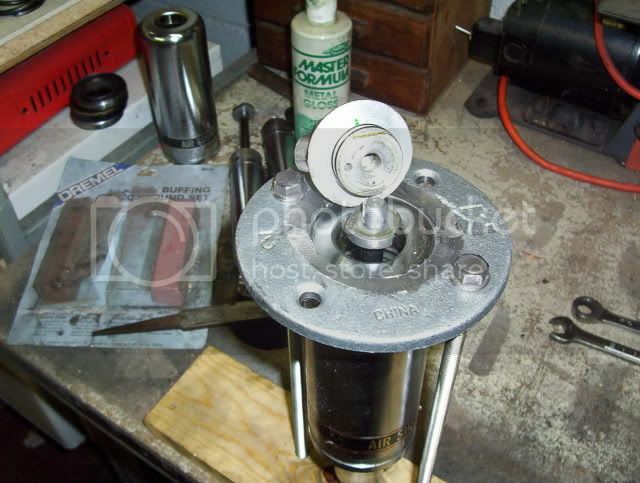 The threaded barrel of the flange has already been cut off but is sitting there to give an idea of what it looks like. Here is a shot of the other side showing the tapered opening. 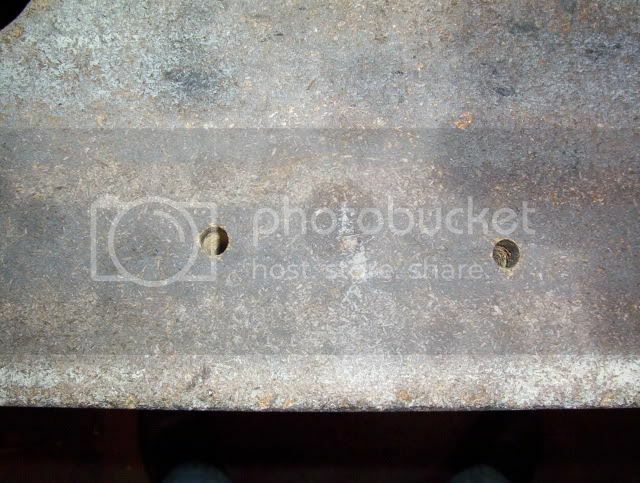 Next I drilled two holes through the top of my work bench (It already has holes in it for rebuilding the front forks. I may do a write up on that as well later). These holes coincide with two bolt holes in the "donut". 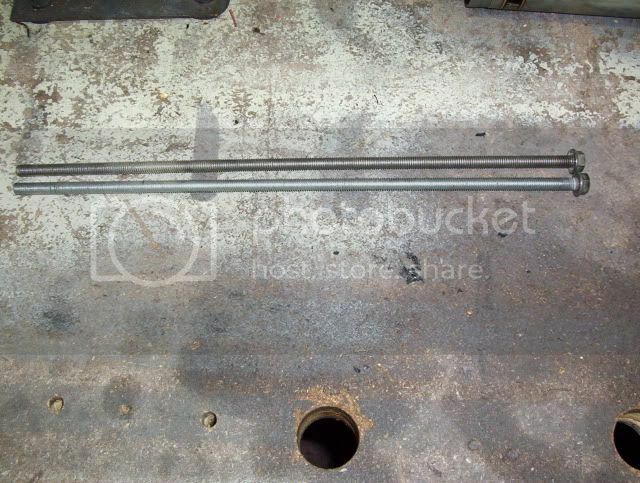 I then drilled corresponding holes in a piece of one by four that I cut a trough in. 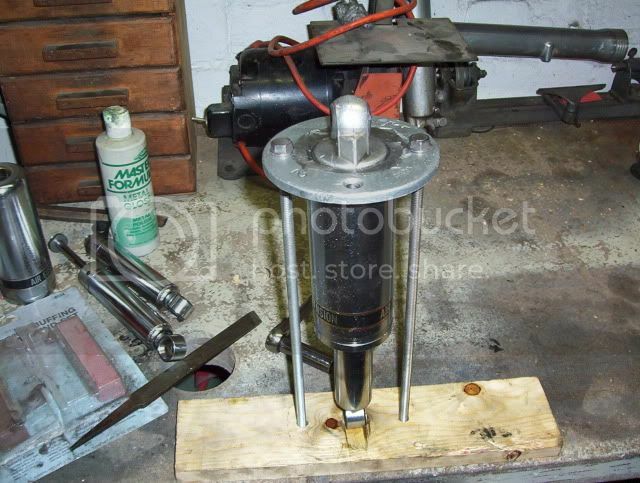 This will act as a rest for the bottom of the shaft of the shock. It's cut pretty rough but it need not be pretty to work. Next I cut two lengths of threaded rod. These are 16 and one eighth inches long. 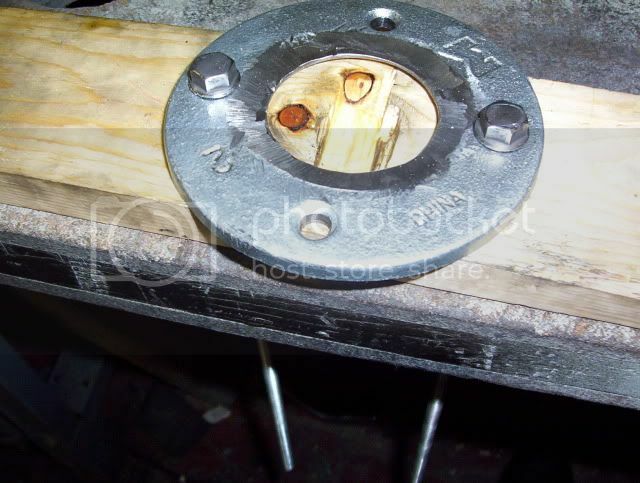 I then plug welded self lacking nuts to one end of each rod. Close up of the plug welded nuts. I ground them off flat after welding. Using apiece of flat stock I had on hand I built a T bar. 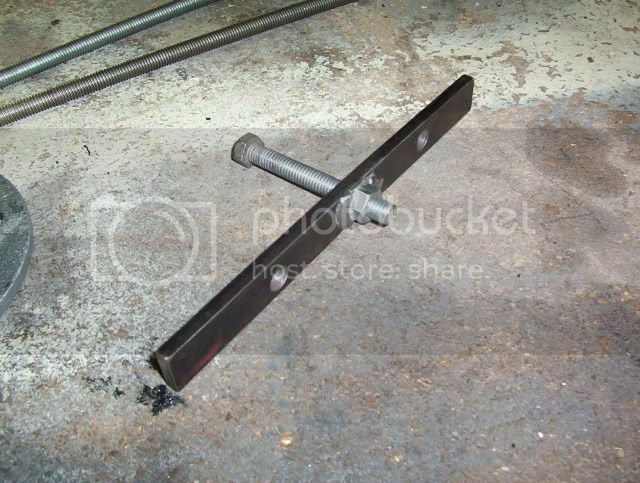 This is used to draw the the threaded rods down through the work bench top evenly. I drilled three holes in it. 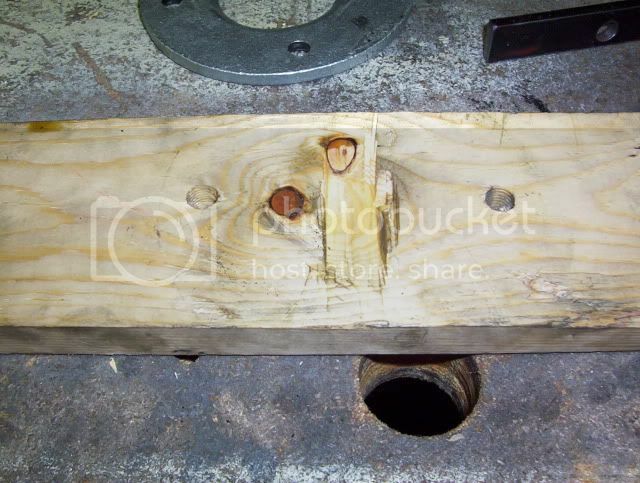 Two corresponding with the holes in th e"donut", the base and the work bench top. And one in the center. 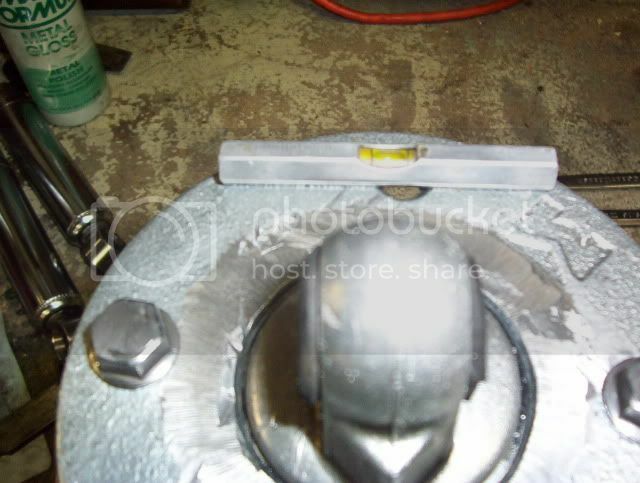 The center hole I welded a self locking flanged bolt to. Which accepts a three inch bolt. 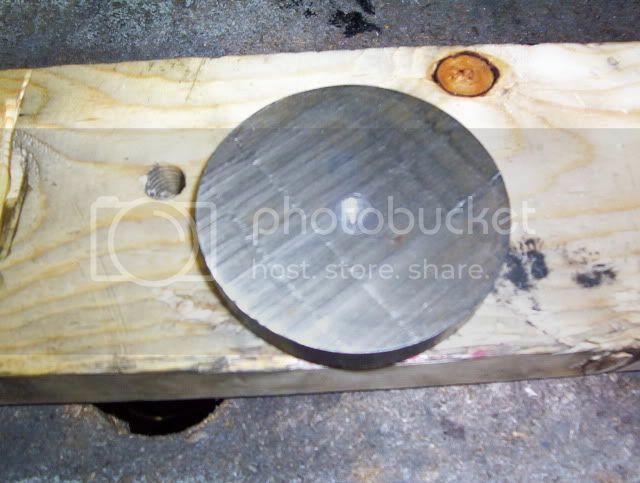 I also had a slice of round stock on hand for the next part of the tool but square stock could be used. I drilled a divit in it for the bolt to rest in. 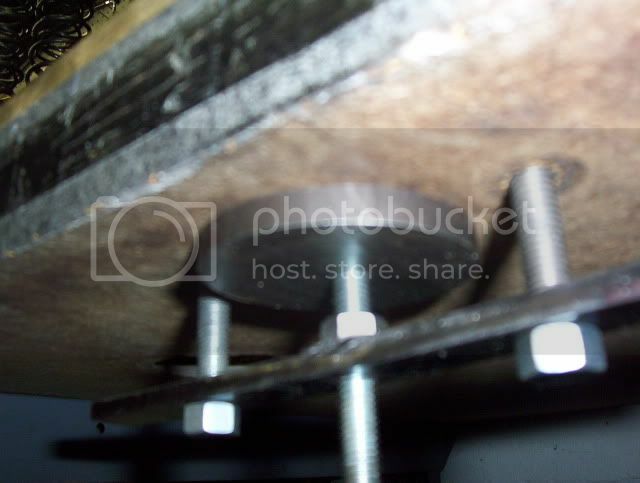 (yeah I know it's off center) This part is to keep the bolt from chewing into the bottom of the work bench top. Fitting of the T bar. 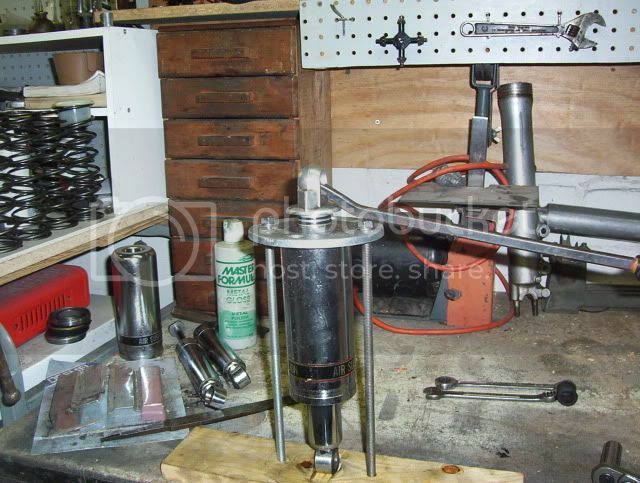 Here is a shot of what the rig looks like with the shock in place and ready to be compressed. 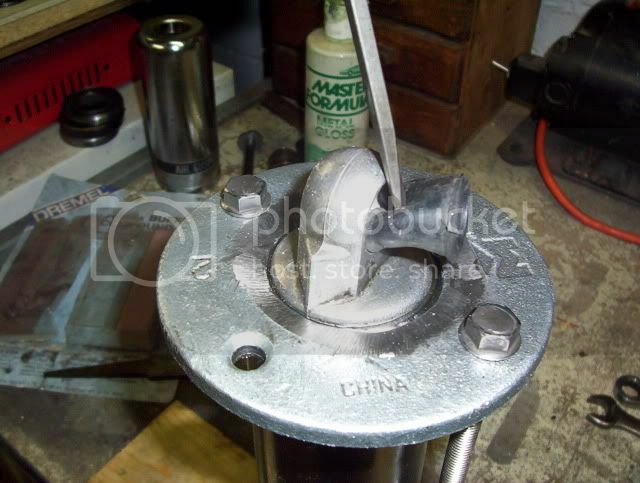 I used a small line level to make sure the two rods were being drawn down evenly while compressing the shock. 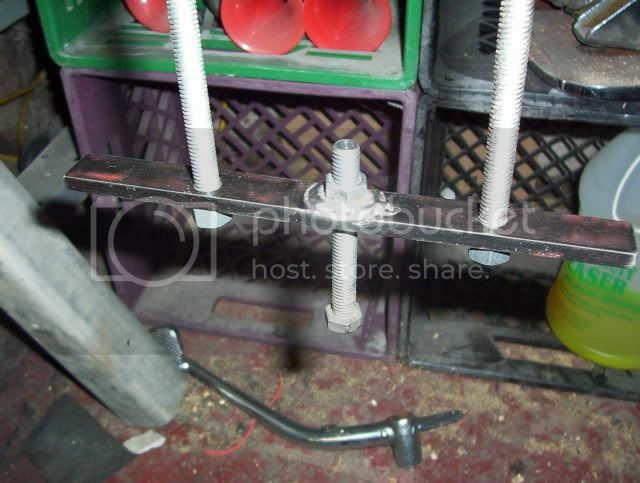 You can adjust this by tightening the nuts on the bottoms of the threaded rods as needed. You need to compress the shock about two to two and a half inches. 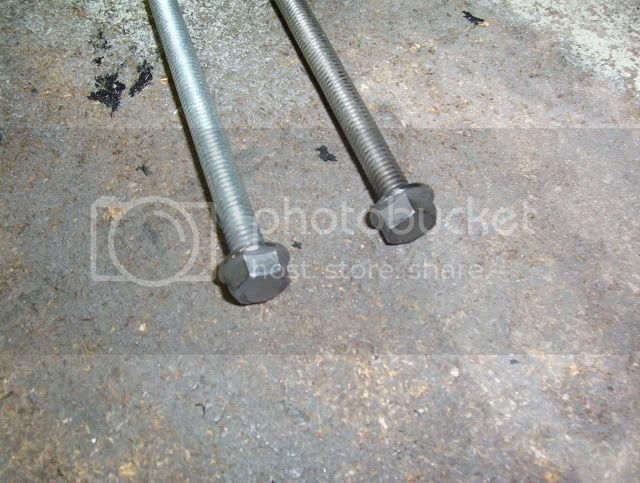 Use a ratchet to tighten the bolt, this will draw the threaded rods down through the rig. Here is a shot with the shock compressed. Note the bolt tightened into the T bar. 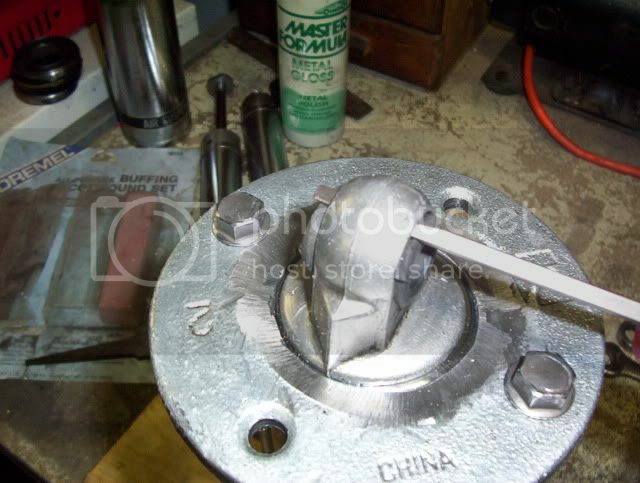 Use a flat head screw driver to remove the rubber bushing so it does not get damaged. Or so it can be replaced with a new one like I did. 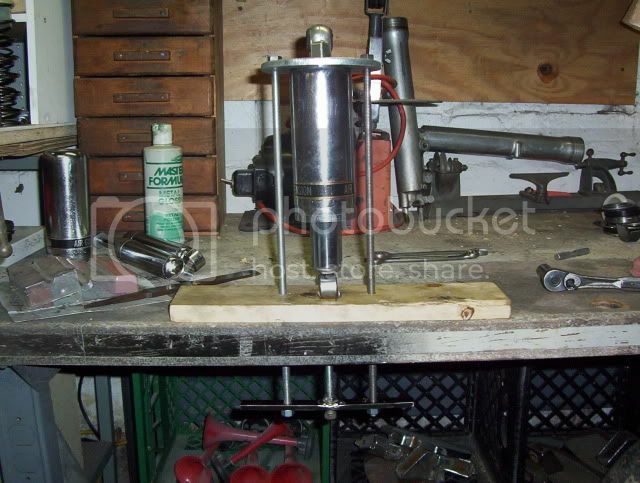 At this point it should be fairly easy to pry the head of the shock out because it is onlyheld in by O rings. I used a pry bar. 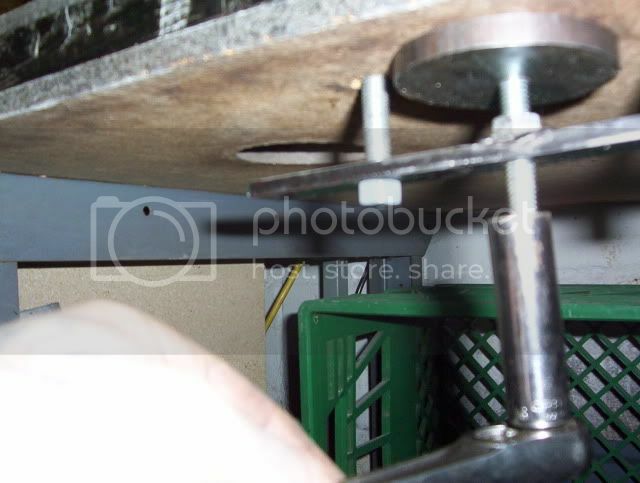 The welded on nuts make a perfect base for prying. 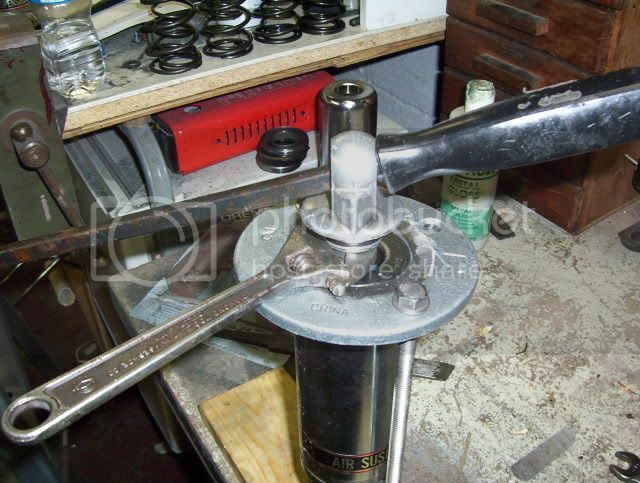 Use and adjustable wrench along with the pry bar to losen the shock head from the shaft. Completely unscrew the shock head.